No. 539 "Soft Head Harness"
We refer to the No. 539 as a Victor Sporting Goods head harness, however, the identical model was offered by Horace Partridge, Rawlings, and other retailers in the early 1900's without reference to Victor. It is possible that Victor mass-produced these head harnesses for sale by other retailers, or that an unknown manufacturer wholesaled them to Victor and others. It's fairly common to see vintage football helmets listed on EBay and auction house websites displayed backwards on a headform. In some cases, it can be difficult to tell which side of a head harness was intended to be the front without a catalog reference, particularly with helmets manufactured prior to 1905 after which extended rear neck flaps became prevalent. While the player in the c.1899 photo above is wearing a No. 537S with the adjustable strap in front, the catalog images above clearly show that the No. 537/539 was designed to be worn with the scallop-shaped leather forehead protector in the front and the adjustable strap to the rear. Our September 2018 Artifact of the Month is a circa 1904-1910 Victor Sporting Goods No. 539A Raincap-style head harness. In 1902 Victor sold a similar model, the 537S, that was manufactured out of heavy sole leather, a material outlawed in by the Intercollegiate Football Association in 1903. Following this ban, Victor modified the No. 537 to comply "with the revised playing rules." The No. 539 came in three different models. The No. 539A, the Victor "Soft Helmet," was manufactured out of French calfskin and retailed for $3.00 in 1904. The No. 539B utilized a lower grade tan cowhide and retailed for $2.25. The cheapest model was the No. 539D, which was manufactured out of "fabrikoid," likely a canvas or knit material, and sold for $2.00. Such was the hierarchy of turn-of-the-century American football equipment. 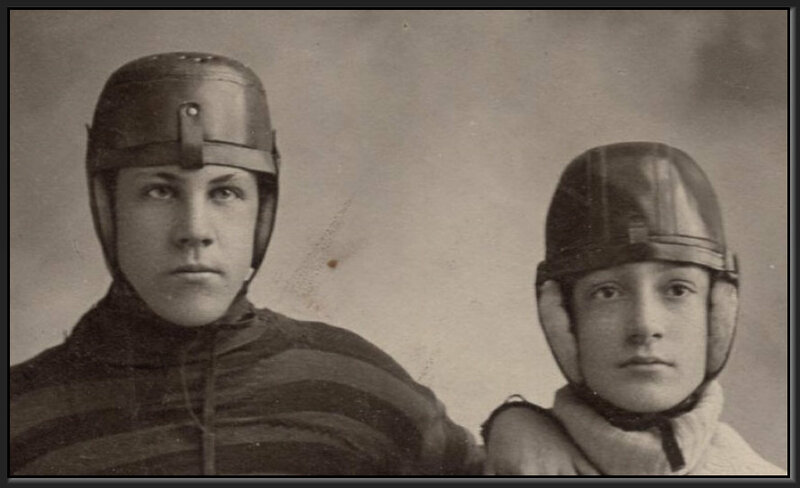 Early head protectors and head helmets were infrequently used, a fact that makes surviving examples so rare. 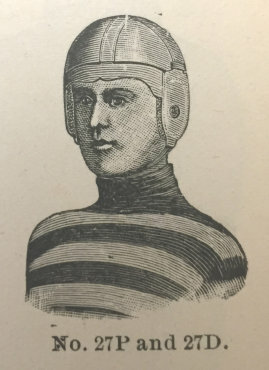 By 1915, head harnesses had become standardized equipment as athletic associations sought to improve player safety and the game's reputation of brutality. The image to the right shows two circa 1900 players wearing two of the earliest head harnesses, the Spalding No. 50 and what is likely a Victor No. 537S. Both utilized a leather strap at the forehead which allowed the harnesses to be adjusted to different head sizes. Based on the catalog images above, one may assume the player on the right was wearing his helmet backwards in this photo. Several months ago we acquired a photo of a youth team in formation on a snowy street in which eight players are wearing the No. 539 head harness. Three of the players are wearing their head harnesses with the adjustable strap to the rear while five of their teammates have opted for the reverse with the strap at their foreheads. Based on this image, we conclude that while the No. 537/539 was intended to be worn as shown in the catalog, its design was sufficiently neutral to allow players to wear it either way. Like most nineteenth century head protectors, the No. 539 placed emphasis on ear padding. The surviving example below has 1" thick cotton padding on the ears and 1/8" thick wool padding for the sides, front, and rear of the head. It also incorporated a donut-shaped cotton pad in the top interior of the helmet. The No. 539 was a popular model, enjoying a long manufacturing run between the late 1904 and early 1910's. In 1907, a similar model, the Rawlings No. 25, was described in a manner that would be sure to invite a plethora of lawsuits in the modern era; "Injuries to the head do not occur when this Helmet is worn."